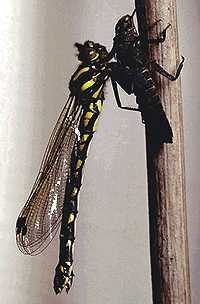 Almost all odonate larvae are aquatic. They occur in every sort of water body from soaks and seepages to streams and rivers, lakes, temporary pools and water-filled tree holes. A few species tolerate moderate salinity, a few others have semi-terrestrial larvae which roam across the surface of bogs and swamps at night. A half-dozen or so fully terrestrial larvae are known from distantly related families. 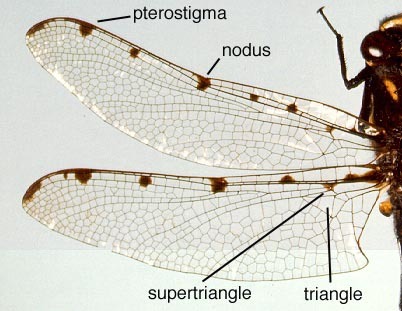 Trueman (1996) applied cladistic parsimony analysis to a set of wing vein morphological characters, finding in favor of Fraser's (1957) "paraphyletic Zygoptera, paraphyletic Anisozygoptera" hypothesis. In contrast, Bechly (1995, 1998), using a non-quantitative approach (Hennig's argumentation scheme) that assumes prior knowledge of ancestral character states and involves ad-hoc resolution of character conflict, favored a monophyletic Protozygoptera that is sister to the modern suborders, a paraphyletic Anisozygoptera, a monophyletic Zygoptera and monophyletic Anisoptera. Nel et al. (1993) and Lohmann (1996) made similar assumptions to Bechly and came to roughly similar conclusions. Lohmann established a strong case for regarding extant Epiophlebiidae as the sister group to the rest of the Anisoptera, rather than as Anisozygoptera. 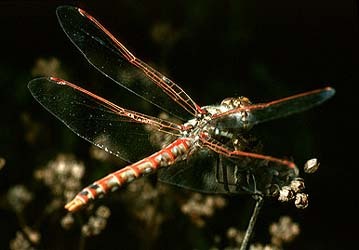 It would thus be logical to extend the Anisoptera to incorporate the Epiophlebiidae. Bechly, G. 1998. The Phylogenetic Systematics of Odonata. Internet website http://www.bechly.de/phylosys.htm developed and maintained by the author. Phylogeny (Gunter Bechly) One view of odonate systematics. Line drawings copyright ? 1997, John W. H. Trueman and Richard J. Rowe.